Leather jackets, which usually cost $300-$600, are investment-worthy pieces because they can last a long time and be worn everyday. They look great with t-shirt and jeans, and they look just as a stylish over cocktail dresses. This leather jacket from Torn by Ronny Kobo retails for $600, but you can pick it up for just $164.99 Williamsburg-based Peachfrog's eBay store. 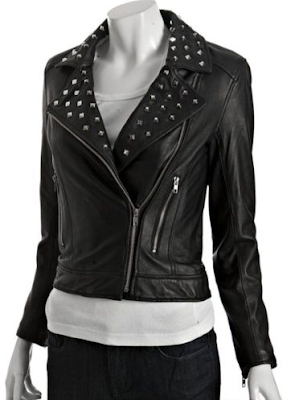 The studs clearly make the jacket a bit trendier, which could be a good or a bad thing depending on how you look at it. Either way, it's an undeniably good deal for a true leather jacket. Such a good colour! The detailing's incredible too .